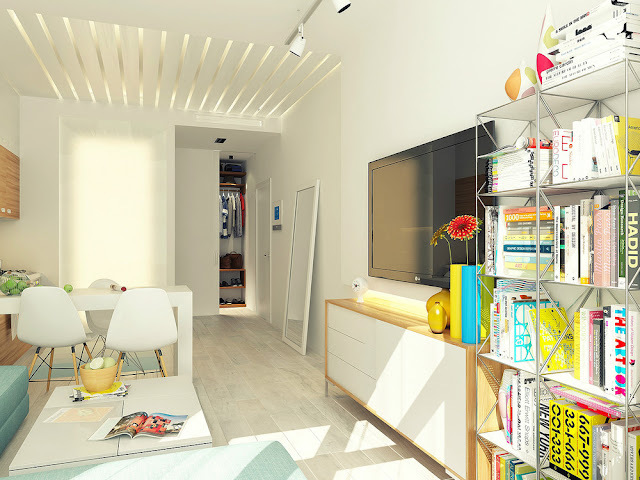 Having small apartment, it does not mean that you can not explore your apartment. You can check Anton Grishin design product that show how to decorate your small apartment in a good way. Grishin apply open plan idea to make the apartment comfortable and use bright color to make the apartment brighter. Small kitchen with versatile furniture is very perfect idea for your apartment. Kitchen island with dining table in versatile furniture will economize your area. Some Eames chairs near the dining table area will make you comfortable in enjoying your food. A carpet on this small kitchen will also make this kitchen more beautiful and warmer. Next to the kitchen Grishin put blue bright living room with L sofa and some cushions in blue, white and yellow. White table makes this sofa very perfect. A blue painting hanging on the wall is very nice ornaments of this area. Plants near the sofa will make this living room fresher, because you will get more oxygen from the trees. Some cabinets on your wall near the ceiling will help you to put your old stuffs that are rarely uses. Choose right color for your cabinet, it will be better if you put same color with your wall. It has purpose to camouflage this cabinet, so your living room is looked large. Windows on your small apartment will also help you give wide effect to your apartment.